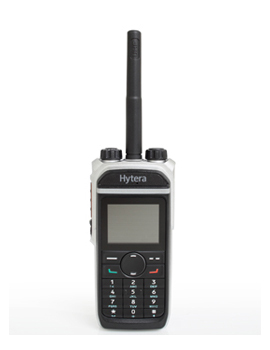 The HYTERA PD682i is a 1.8” Color Display, compact Analog and DMR Digital Two way radio with full keypad. With 1024 channels, voice annunciation and VOX (Hands Free Mode) this user friendly two way radio makes migration from Analog to Digital a simple process. Each channel can be programmed to either Analog or Digital mode allowing for both forms of communication to be used on one radio. The PD682i’s Wide frequency range allows FEDERAL and Commercial frequencies to be programmed. Covering the UHF 400-527MHz band with 4 watts and the VHF 136-174MHz band with 5 watts, the PD682i can be used in direct or repeater mode. The PD682i includes value added digital features such as One Touch Call, multiple Digital voice calls, including Pseudo trunk (HYTERA EXCLUSIVE FEATURE) which enhances the channel capacity of the radio. Basic encryption is available in Digital mode with higher encryption standards available as value added options. The PD682i can have optional Digital features such as GPS, MAN DOWN, DMRA DATA, ROAMING, Decode Radio Enable, Radio Disable, Remote Monitor and Priority interrupt. Up to 25 Digital canned TEXT Messages and ONE TOUCH CALLS can be sent from the PD682i by utilizing the programmable feature of the buttons on the radio. The COLOR 1.8” LCD display allows for Caller ID and Groups to be easily identified. The LCD display increases the efficiency and effectiveness of the radio. Its full Keypad also allows for FREEFORM text messages to be generated and responded to. This feature increases its value during surveillance operations. The PD682i analog features include Multiple advanced signaling modes such as CTCSS/CDCSS, HDC1200 (resembling MDC1200), 2-Tone,5-Tone and Scrambler for increased privacy. With a standard High capacity battery and based on the 5-5-90 standard, the radio can provide up to 16 hours of Digital communications. Meeting the IP67 standard (INGRESS IN WATER UP TO 1 METER FOR 30 MINUTES) and MIL-STD 810 C/D/E/F/G testing for Humidity as well as shock &vibration, the PD682i is designed to be rugged, not just compact. The PD682i’s size, features and ruggedness offers hospitality, shopping centers, restaurant, security, schools, maintenance and executives a fully featured two way radio that can be easily and discreetly carried. The PD682i is covered by a standard 3 year Manufacturer’s warranty which can be increased to 5 years with the optional 2 year extension. The PD682i is comparable to the Motorola MOTOTRBO XPR3000/3500, XPR7000 Series, SL7500. The PD682i can be WIDE BAND converted for HAM (amateur radio) use ONLY. The user must have a valid FCC License for the removal of the Narrow Band USA mandate. EXTRA CHARGE WIDE BAND CONVERSION FEATURE NOT AVAILABLE TO OTHER USERS.